Everyone has heard that a dog is “man’s best friend,” but the truth is, they’re so much more than that. Dogs are companions to both men and women. They’re valued members of a well-rounded family. They’re loyal, and in many cases, they bring a level of joy that rivals most other happy moments in life. 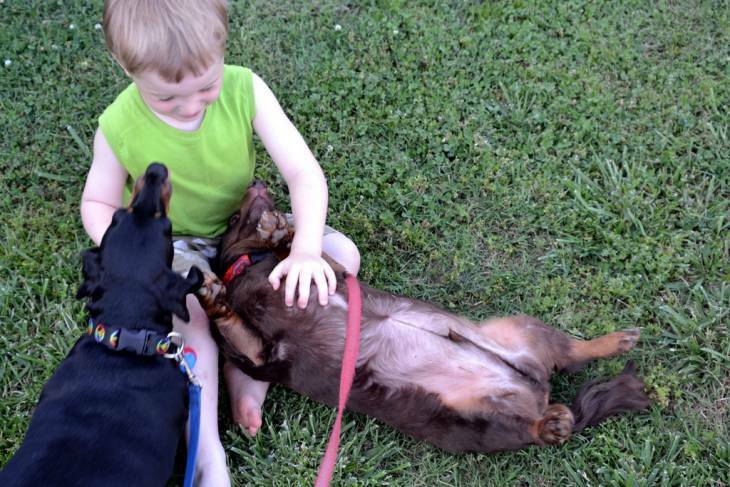 When it comes to bringing together dogs and children, some parents are skeptical. What if my dog hurts my child? Will I be able to care for both a child and a dog? The concerns are valid, but they overlook some very significant positive aspects of raising a child with a dog in the house. What are some tasks you can assign to your child when it comes to caring for your dog? All of these tasks require discipline for a child, and if they can master these, they’ve come a long way with learning responsibility. Believe it or not...there are many adults who still haven’t quite mastered this level of responsibility! It makes sense too - at an earlier age, when a child’s social skills are still developing, they are often a lot more sensitive. A dog is the perfect friendly companion that doesn’t judge, and only wants to be loved. According to the American Heart Association, owning a dog may help prevent heart disease. The reason behind this is clear: Those who own dogs tend to spend more time outside, walking and running around. Sure, they may not understand what you’re saying, but there is a psychological benefit to having someone or something there to listen to you. And this is especially true for children, who sometimes don’t feel comfortable talking to their parents or other adults. One study finds that infants who lived in the same house with a dog during their first year of life were about one-third more likely to be healthy during that first year, compared to babies who didn't have a pet in the home. If there was ever a reason to get a dog for your kid, this one is certainly very compelling. One important distinction that the study points out is that the dog must be in the home when the child is still an infant - after the first year, there appears to be no correlation between having the dog and a reduction in allergies. Researchers don’t know for sure, but they suspect that while the child is an infant and is still developing its immune system, exposure to dog allergens and other dog-related bacteria actually strengthens the immune system and reduces the chances for future allergies to dogs. #8: Dogs can help reduce stress for kids, particularly those with autism. Let’s be honest - as a parent, there are few things that bring you joy as much as getting a cute photo of your kid. And if you can add a dog (or even better, a puppy) to the equation, you’re set up perfectly for the cutest possible photo opportunity. Lassie, a TV dog, was always portrayed as a supremely intelligent dog with the ability to sense danger and save a boy named Timmy. Although that may seem far-fetched (okay, no more puns), it’s based somewhat in reality. As most experienced dog trainers and those who study and understand dog socialization will tell you, dogs instinctively understand the concept of “family” (or more appropriately, their “pack”). Dogs learn who their family is and won’t hesitate to protect them. Similar to the points about about getting sick less frequently or reducing the risk of allergies, the reason that kids who live with dogs have a lower risk of respiratory problems is because of the additional exposure to bacteria the dog brings. This doesn’t sound like a positive point on its face, but this exposure to bacteria helps strengthen the child’s immune system while it’s developing. Researchers in Poland studied the impact of keeping dogs at home on the social development of 530 children between the ages of 4 and 8. Those children with dogs had higher scores in pro-social behavior and self-reliance than those without dogs. A study in Germany found that children 6-17 years old with diagnoses of anorexia, bulimia, anxiety disorder, and autism had improved behavior with a therapy dog than without one. A study in Australia concluded that animal-assisted preventive efforts are an optimal vehicle for promoting nurturing and empathy. Dogs and children often form a bond that is reinforcing - children make dogs happy, and in turn, dogs can make children happy. And when one is feeling hurt or sad, the other can help. This relationship is the very foundation of empathy and compassion. #13: Dogs are...lots of fun! Yes, I saved the best for last. As a dog owner ever since I was a little kid, I can attest to the fact that growing up with a dog was definitely one of the happiest and most memorable parts of my childhood. Furthermore, having fun with a dog is an activity that can help you bond with you child, as you can play games together, care for the dog together, and overall, enjoy the time spent together. What are you waiting for? Go get a dog! The truth is, despite the many reasons to own a dog (and the benefits they can provide to a child), the decision to get a dog is still a big one. Dogs require a lot of responsibility, and if your child hasn’t even been born yet, you’ll want to make sure you’ve taken the appropriate steps to get your dog ready for the baby. But if your family has made the decision that you’re ready to get a dog - go for it. You’ll be really happy you did. This article was written by Eric G., founder and author of Cynical Parent (a blog where he explores parenthood from a fresh perspective). For other unique, helpful parenting tips (and some more discussion on the interaction between dogs and kids), check out his blog. Great read! 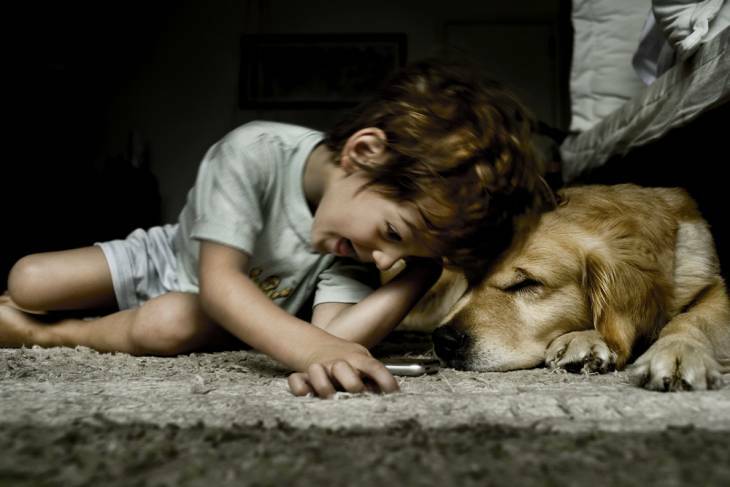 A dog also helps to treat behavioral problems in kids. Playing with a dog can calm a hyperactive and overly aggressive kid. I think all children should be exposed to animals especially dogs. Great list of reason kids should have dogs. Thanks a lot for your post. I read your post and now I realize the importance a dog for my child.But I don’t know how to care my dog and my son.I am waiting for your next post. I really appreciate point number 8 above with its reference to children with autism. I have two adult children with autism and the influence of an amazing dog richly enhanced their lives. You can read about it in a book I wrote, “My Sweet Lady”. I have started a blog about our continuous journey with dogs and autism. I would love for you to visit my website, dixieschaefer.com and comment on my posts. Thanks for your insights.